In your favorite color, Cobalt Teal for me! It’s hard not to feel better when you wear a tutu! We all have those days when we need to twirl and feel girlie and just lighten up a bit! Yesterday was one of those days where I was feeling kind of beat down. But I know that even though I can’t please everyone, I can strive to be true to myself and to do the best job I can. Do you need a tutu day? 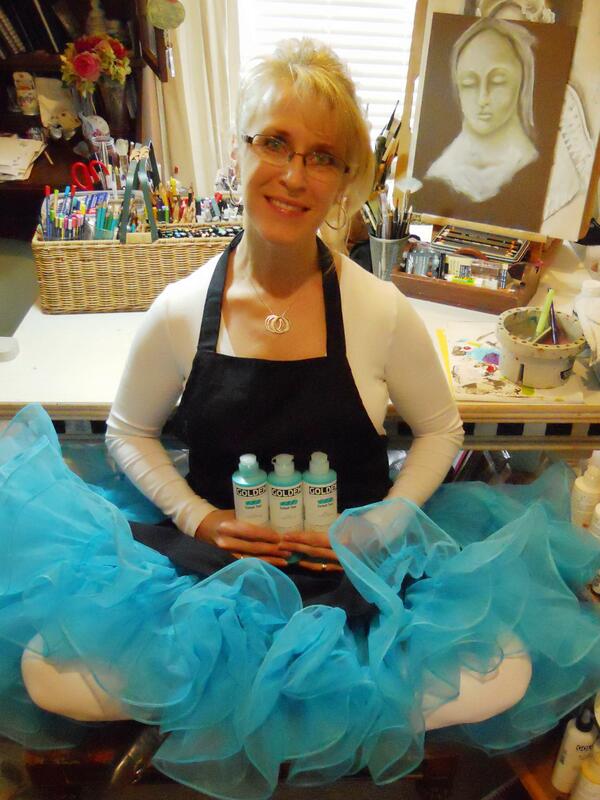 Check out Carrie Clayden’s awesome website and see who else wears a tutu! Thank you Carrie for sending me this fun present, it’s the perfect thing to get me out of my funk! oh yes! i LOVE a tutu and wear mine as you can see. this is a fantastic blog. Pam – I just love the little laddered table you have for your supplies – where did you get that – or is it still available in the world? I’ts perfect! I want a cobalt teal tutu! I’m really enjoying your book too, I’m about 2/3 of the way through and I am savoring every delightful page!!! Okay, I’m willing to try it! I guess you’d at least have to laugh at yourself, right? Now, where did I store all my tutus….? ok, this post just made my day!!! i need to get me one of those for sure. where did you find it? only problem, if i buy one for myself, i have to get two more for both of my girls. every girl needs a tutu! thanks for the smile! You look adorable. Thanks for sharing this. It made me smile. I enjoyed this post, since my two little girls had me pull out their tutus two days ago, and they’ve been wearing them around–to play in the yard, put together puzzles, race through the house. There’s nothing like little girls in tutus to put a smile on your face–except maybe MEN in tutus (I loved the link you provided!). I guess maybe I ought to get my hands on a tutu for myself now! Carrie ordered one for me in RED! I can’t wait… I’m going to be wearing it during my upcoming class at her studio! She is so much fun and the fact that she gets so many people to wear tutus – even cliff divers! – makes you want to join in on the fun! 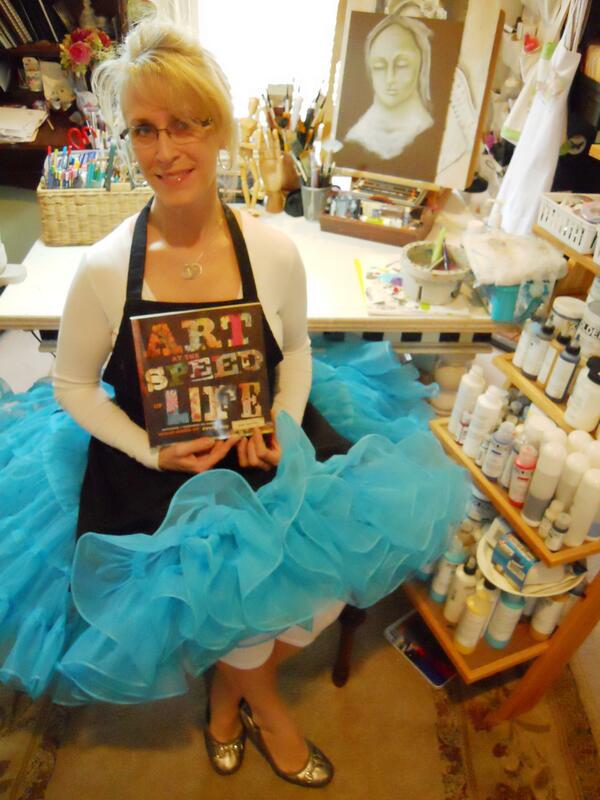 Love the tutu, love the color….and you brightened my day too!! Okay, I am adding this to the best ideas out there. I love the color too. I wore a tutu on my head to a party a few months ago. I like different colors in a tutu, that´s why I made one myself and it is REALLY easy, no sewing, just a little time, that´s all. Thank you for this beautiful message :)! I’ve a soft spot for turquoise too. Let’s all join together and dance in the sunshine, now where did I put my tutu. Thanks for brightening my funk day too. You r looking great hun!! Love the tutu. The color is awesome!